[155 Pages Report] The industrial sugar market is estimated to be valued at USD 35.69 Billion in 2015, and is projected to grow at a CAGR of 6.01% during the forecast period of 2016 to 2022. This research study involves the usage of extensive secondary sources (which includes directories and databases) such as Hoovers, Forbes, Bloomberg Business, and Factiva—so as to identify and collect information useful for this technical, market-oriented, and commercial study of the global industrial sugar market. In-depth interviews have been conducted with various primary respondents, such as key industry participants, subject matter experts (SMEs), C-level executives of key market players, and industry consultants, among other experts, to obtain and verify critical qualitative and quantitative information as well as to assess future prospects. The following figure shows the market research methodology steps applied in drafting this report on the global industrial sugar market. The global industrial sugar value chain consists of three main components, namely, production, processing, and distribution. Sugarcane production around the globe is dominated by smallholder farmers (out growers), with only a few factory-owned farms (nucleus estates). The processing component of the value chain consists of a number of public, private, and mixed-owned factories distributed throughout the sugarcane production areas. The distribution after processing is highly integrated between wholesalers, retailers, and importers, which is further distributed for consumption to the food & beverage as well as animal feed and energy industries. The value chain helps in bringing about coordination among stakeholders with market leaders such as Cargill incorporation (U.S.), Archer Daniels Midland (U.S.), Raizen SA (Brazil), Sudzucker AG (Germany), and Tereos (France). On the basis of type, white sugar is the largest and fastest growing market as it is the most common type of industrial sugar used globally. 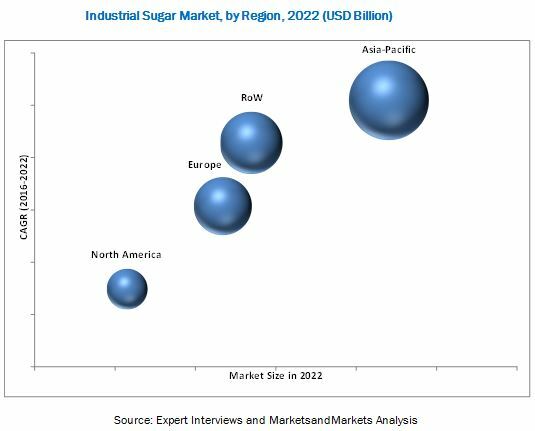 Factors such as growing demand for confectionery products, growing retail market and expansion of product portfolio are driving the demand for industrial sugar globally. Changing consumer preferences about different products has led to an upsurge in the consumption of different food and beverage products globally. On the basis of source, cane sugar is projected to grow at a significant rate during the forecast period. Sugar cane production is higher than sugar beet production, globally, as all the major developing countries are involved in the manufacturing of cane sugar. On the basis of application, the industrial sugar market is segmented into industries such as dairy, bakery, confectionery, beverage, canned & frozen foods, and other food items. Confectionery is the largest and fastest growing segment during the forecast period due to its use in a wide variety of applications and consumption of confectionery products such as marmalade, chewing gum, sweets, candied nuts, chocolates, and chewing gum. 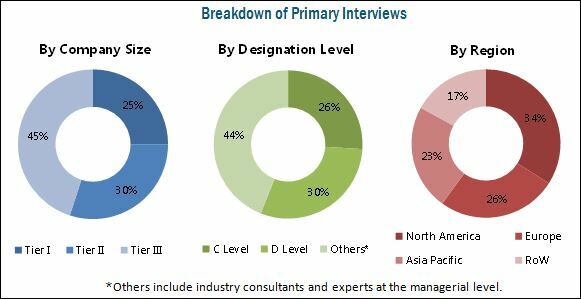 The growing population and technological advancements in developing economies are expected to contribute extensively towards the growth of the global industrial sugar market. On the basis of form, the granulated form is the most extensive type of industrial sugar used globally. This crystallized form of sugar is also used as a preservative for different end-use applications such as candied fruits, jams, and marmalades; thereby, increasing its functionality and driving its consumption. India is one of the largest consumers of industrialized sugar and is projected to grow over a period of time as compare to other regions worldwide. Asia-Pacific in expected to grow from 2016 to 2022 due to urbanization, which has fueled the growth of the global industrial sugar market. Acquisitions and expansions were the key strategies adopted by the key market players to ensure their growth. Major players in the market include Cargill Incorporated (U.S.), Archer Daniel Midland (U.S.), Raizen SA (Brazil), Sudzucker AG (Germany), and Tereos (France). Key players in the market are emphasizing on promotional activities, advertising campaigns, and social media marketing to expand their horizon and gain a competitive advantage in the market. Also, these players are marking notable efforts to enter developing nations to exploit lucrative market opportunities.